How England bowl to Clarke, and how he does, could decide the match. 152 more needed, eight wickets in hand. Anderson gets a thick edge off Clarke but it goes straight on to the ground. England have been hopeless with their reviews the last few times. That smacked of desperation from Alistair Cook; no strength as a skipper; trying to buy some luck; neither team has succeeded with that! Hard to believe Australia were 147 for 1 just an hour or so ago. England looked out of ideas. Now their tails are up. Australia have lost five wickets for 32 runs in 13 overs. Siddle ducks into a bouncer from Broad. It cannons off the end of his bat handle to deep square leg at a rate of knots! It's out! Hawkeye said it was clipping the outside of the leg stump. Harsh. England will not care one jot. No foot movement from Harris as Broad traps him in front with one that kept low, but Harris got a vital bit of bat on it. Broad revving the engine in this spell. He's bowled his fastest ball of the match (91 mph). The adrenaline is flowing. Aleem Dar says it's still not light enough for pace bowling so Root continues to Siddle. No problems for Siddle as he safely negotiates a maiden. Right, the sun is officially back out. Jimmy Anderson comes back on and Bird pushes him through the covers for a single to get off strike. Then Siddle cuts Anderson for four. It will surprise no one to learn that these Aussies will not go quietly. Close! Siddle chips one into the leg side but it's just short of Bresnan. The crowd roar as Broad comes back into the attack. Can he finish it? Siddle spooned a good length ball straight to Anderson at mid off. The England players celebrate. Captain Cook has a souvenir stump. The crowd rises to Broad as he raises the ball to the crowd. 11 wickets. No doubt who man of the match will be. 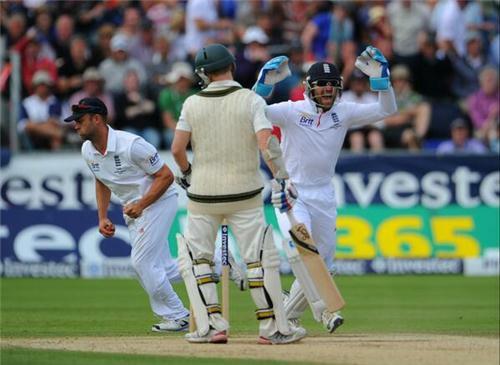 England clinched a series win with a superb two hours of bowling in the evening session. But, having set Australia 299 to win, the game was very much in the balance until Tim Bresnan snared the crucial wicket of David Warner. Warner and opening partner Chris Rogers blunted the new ball and put on 109 for the first wicket. At that stage, just before tea, England looked short of ideas and were in danger of losing their nerve. England regrouped at the break and got their bowling exactly right in a mammoth two-and-a-half hour evening session. When Warner edged Bresnan to Matt Prior to leave Australia 168 for three, they felt the door was ajar. Then Stuart Broad kicked it off its hinges. Broad topped 90mph as he ripped through Australia's middle order and tail end. 168-3 became 181-7 and Australian hopes were gone. Broad took care of the tail with full, fast and straight deliveries to finish with six wickets, 11 in the match. When Peter Siddle chipped Broad to James Anderson at mid off, Australia were all out for 224. 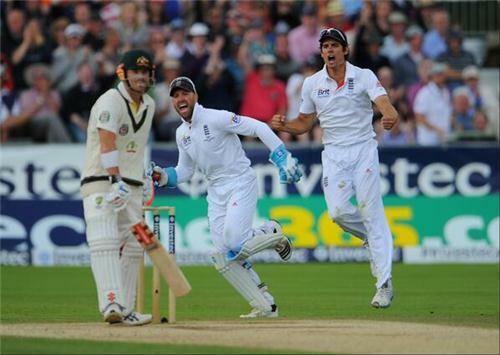 England won the Test by 74 runs and clinched the Ashes series with a game still to play.